A welcome bonus that offers you £70 of bingo tickets and free spins! Get £70 to play with When Signing Up Today! What sets Blighty Bingo apart is its convenience. Opening up in 2017 may have had its advantages as they were able to make use of the latest technology from the get go. Filled with a wide variety of games, and graphics that take your breath away, Blighty Bingo makes an impression that stays! One of the most important aspects of every online bingo site is its welcome bonus. A welcome bonus is there to reward new players for signing up and give them some fun without having to risk any of their own money! Blighty Bingo’s welcome offer definitely stands out and players may be drawn to the bingo site for its welcome bonus alone. How it works is that players are required to make an initial deposit of £10, but they get £80 to play with, so essentially the bingo site gives you a free £70! It is important that new players use the BLIGHTY bonus code in order for this welcome bonus to be activated. This free £70 is divided into Street Party and Big Bang, two of Blighty Bingo’s popular, themed bingo rooms. Players can use their newly acquired funds to buy bingo tickets and take part in bingo games. Along with these funds, players are awarded with 10 Free Spins! These spins can be used on the fun and exciting Fluffy Favourites slot! The free spins expire within 7 days, so best to use them straight away. The way a bingo site looks is also a very important factor. You don’t want to be playing games where you’ll need to shield your eyes! Blighty Bingo has gone with a classic look and used the British colours of blue, white and red. These bold, primary colours have a refreshing appeal, definitely assisting in Blighty Bingo’s aesthetic appeal. The feel of this site has an easy flow to it, everything is easy to find and even novice players should have no problem navigating their way around the site. 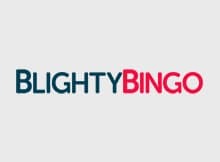 With a name like Blighty Bingo, you automatically expect a wide variety and a focus on bingo games; well you are not going to be disappointed! The bingo games on this site come from Dragonfish B2B, who is respected and popular within the bingo industry. On top of bingo games, there are also themed bingo rooms such as Last Call, Ace Club, Street Party, £10K Sunday Blast, £600 Monday Chill and many others! If you are a bingo fan, you are sure to love what Blighty Bingo has in store for you. On top of all the exciting bingo games you can play on this site, you can also play some of your favourite slot games! Blight Bingo’s slot game collection is quite impressive, with over 300 slot games to choose from. This collection contains a wide variety, from old school favourites to the newest releases from giants in the industry such as NetEnt, Nextgen and Betsoft among others. It is almost guaranteed that whatever your slot preferences, you should find something that takes your fancy. Welcome bonus worth £70 of bingo tickets and free spins! Making deposits and withdrawals is quite a big part of playing at any bingo site and players look for ease and convenience when it comes to this department. Deposits at Blighty Bingo are instantaneous and make playing at this online casino very convenient. You have all the usual options such as debit cards, credit cards, wire transfers and other payment facilities such as Neteller, Paypal and Entropay. It is up to the player which payment method they would like to use. If players are unsure, they can always speak to a support team member. Withdrawals are also relatively simple. The minimum amount you can withdrawal at a time is £5. The withdrawal options are very much the same as the deposit options. The major difference is that players may have to wait up to a week to receive their withdrawal funds. These days, most players like to have to option to play on their mobile phones as it allows them to play on the go. Dragonfish, the company which powers Blighty Bingo, ensures that most of their games are mobile compatible. The number of mobile compatible games amounts to around 100 games. All these games on Blighty Bingo can be played on your phone with ease. It does not matter whether you have an Android or an iPhone, you can play your favourite Blighty Bingo games. There are so many bingo sites out there, so what makes Blighty Bingo different? Its ease of play and navigation is definitely one of its most outstanding features. On top of this players are treated to wide range of exciting games and let’s not forget the bingo rooms. The focus is definitely on bingo, but the slot game selection is still quite impressive. Since the site has only been around for a few years, we only expect even better things to come from this company. The customer service of Blighty Bingo is available either via live chat or telephone . All calls to from within the United Kingdom are free. The platform has an extensive and informative FAQ- section and a Contact Form.